Welcome to May, did everyone have a good April? As usual, we spent our free time trying to find fun activities for our son. We also made sure to spend time with our friends and family.Our son is now 22 months old and almost a toddler (2 years old). He has so much energy and loves to run around. We seem to be always chasing after the little guy. He loves running around our neighborhood walking paths and grassy areas. 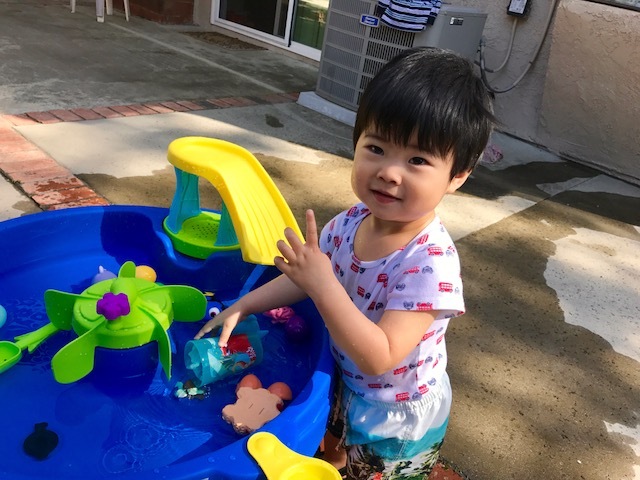 Benjamin loves water and we picked up a water table for him to play with. He loves to splash the water around and get himself wet. 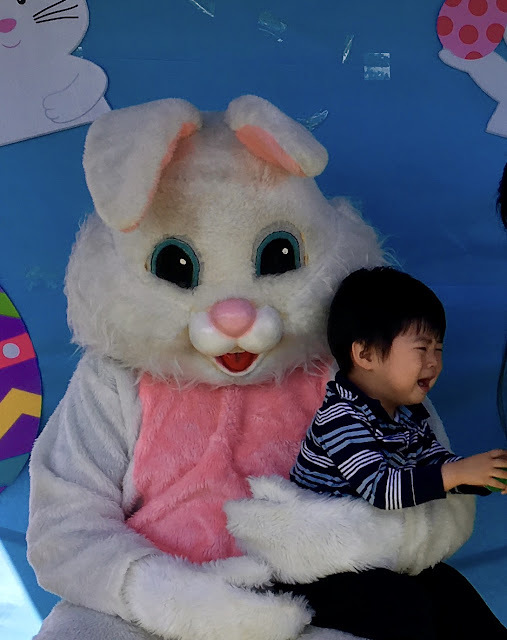 Our son enjoyed his first Easter egg hunt. He wasn’t as interested in getting as many eggs as possible like the other kids. He found two eggs that he liked, and then he just sat down on the grass playing with them. He also wasn’t very interested in the Easter Bunny. This past weekend, we went to the Discovery Cube of Orange County. This science museum has over 100 hands on exhibits that children can observe and interact with. To keep everything fresh and interesting, the Cube regularly introduces new events and exhibits every month. Our son loved exploring and running around the museum. We will definitely be back as we picked up a 2-year family membership and 1-year parking pass ($5 per visit) for $124 after a $10 discount for me being a teacher and $5 discount on parking. It’s not easy finding free time between working, raising our son, taking care of our dog and balancing out our social activities. Until we reach financial freedom, that’s life. This is why we continue to save and invest towards our future. Life is too short to spend most of it working. Here’s our monthly summary of side income that we have generated in the previous month of April. On 4.6, I received a $119.99 statement credit on my Barclaycard Arrival Plus credit card. This covered our one night hotel stay at the Narita Hilton Hotel. I now have 3,459 miles in my account, which is equivalent to $34.59. The annoying thing about Arrival Plus miles is that to get their full value as a statement credit to offset travel purchases, they need to be redeemed in 10,000 mile increments at minimum. Redeeming the miles for gift cards is not worthwhile as it would cost 5,000 miles to get a $25 gift card. To extract value from my remaining points, I would need to earn another 6,541 miles, which would give me 10,000 miles or $100 worth to spend on a travel related purchase. To earn 6,541 miles, I would need to spend $3,270.50, since this card earns 2 miles per $1 spent. I won’t be keeping my Arrival Plus credit card after the first year due to this inconvenient rewards redemption. On 4.11, I received a $25 statement credit on my American Express Blue Cash Everyday card. This was a promotion I took advantage of where I added an authorized user (my dad) and spent $250 to get a $25 statement credit. That temporarily made my Blue Cash Everyday card a 10% cash back card (up to $250). On 4.4, we received a net profit of $450 from our rental property. Comparable rental rates are going up in our rental property neighborhood and so it was time to increase the monthly rent by $20. Our tenants had no issues signing another lease, because they are in a great location and the rent increase was minimal. With no roommate in our house, it’s kind of nice to have 100% privacy again. The downside is that we won’t be receiving an extra $700 a month of side income. We may be open to the idea of having other temporary housemates in the future. All of this totals $594.99 from our side hustles for the month of April. Not our best month, but some income is better than nothing.